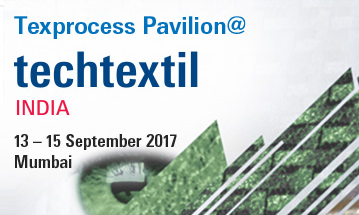 Techtextil 2017 launches Texprocess pavilion which is part of the Texprocess brand, the Leading International Trade Trade Fair for Processing Textile and Flexible Materials. Messe Frankfurt launches the first edition of the Texprocess Pavilion @ Techtextil India which will be held in parallel to Techtextil India from 13 – 15 September 2017. The Texprocess Pavilion @ Techtextil India is part of the Texprocess brand, the Leading International Trade Fair for Processing Textile and Flexible Materials. With the participation of international producers of machines, accessories and services for textile processing, Texprocess Pavilion @ Techtextil India will be the most important business platform for the clothing and textile processing industry in India. This year be prepared to witness latest trends in the developing markets from the 13 – 15 September 2017 at Bombay Convention and Exhibition Centre, Goregaon (East) and connect with domestic and international buyers and sellers at a platform that is thriving with potential. Know more about the product group to be displayed, visitor's profile, booking your booth and fact sheet here. Techtextil India has a series of fringe program with numerous highlights such as special exhibitions, interactive workshops, and knowledgeable seminars add extra value for your presence. Techtextil India has been successful in holding various symposiums that has emerged as the primary conference for highlighting the prowess of technical textile and nonwovens sector across the globe with several editions of the conference held over the past years in Frankfurt, India, Middle East and Russia.